10 and 2: Bad for you. This is the latest news from driving professionals for people who drive modern cars with air bags. 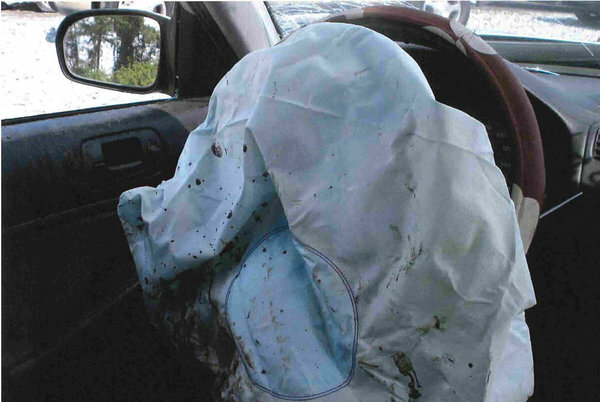 Air bags explode with such tremendous force that they ram our hands and arms into our faces if we follow the old Driver’s Ed rules of keeping our hands at higher positions on the car’s steering wheel. The exploding bags bust up our faces by turning our hands, wrists & forearms into missiles that slam into our eyes and break our noses and cheeks. then the bags blast our hands downward and outward ~ away from our faces ~ . Small people and kids under 13 really should never sit in the front passenger seat of cars with airbags, unless you turn OFF the airbag. Airbags are designed to stop heavy 200 lb – 350 lb people, so they launch out with such explosive much force that they can permanently maim or kill people under 100 lbs or children under 13 years of age. Again: Small people and kids under 13 really should never sit in the front passenger seat of cars with airbags, unless you turn OFF the airbag. My apologies to people who are sensitive to graphic images ~ but this issue threatens us and our families and friends. We’re lucky to have such a good community. Just look at any car, post-accident and it’s plain to see. My daughter rear-ended another car… she received heavy bruising in the chest and shoulder area and the other (passenger) airbag destroyed the dash and pushed the rear view mirror right through the windshield. There’s a lot of force in those bags!